Four parks in Dundee – Baxter Rock Garden, Baxter Park, Templeton Woods and Trottick – will fly the prestigious Green Flag this year. 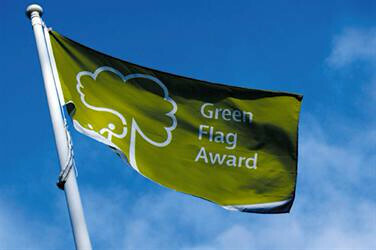 The Green Flag Award is the benchmark for a quality green space. They are administered in Scotland by Keep Scotland Beautiful, the independent environmental charity. Parks are assessed by volunteer judges who usually have a background in parks management, conservation or ecology. They judge against eight criteria testing whether the park or green space is: welcoming; healthy, safe and secure; clean and well-maintained; sustainable; manages conservation and heritage; has community involvement; markets itself, and has good management. This is great news with four of our city parks rightly being awarded for their quality and for what they give their communities. We should be proud of our park managers, their staff and particularly the local volunteers who work all year round in rain or shine to make these parks beautifulI. While these awards are admirable, I do wonder why none of the parks in Broughty Ferry were apparently not worthy of an award? Subsequently, I have been informed about an error in the Press Release from Keep Scotland Beautiful. 'Baxter Rock Garden', should have read 'Barnhill Rock Garden'. I have written more about this in a subsequent posting.